The master of Yiddish folk poetry and Jewish song, Elyokem Zunser was born in Vilna on October 28, 1840 (by other accounts, 1836). Zunser had a difficult youth, growing up in poverty and then conscripted into the Tsarist army along with his brother. While his brother never returned from the military, Zunser was released when forced mass conscription was abolished. Later, his wife and four of his five children were killed in a cholera epidemic, his only other child would die years later in an accident. Zunser settled in New York in 1889, where, through his songs, he agitated for workers’ causes. 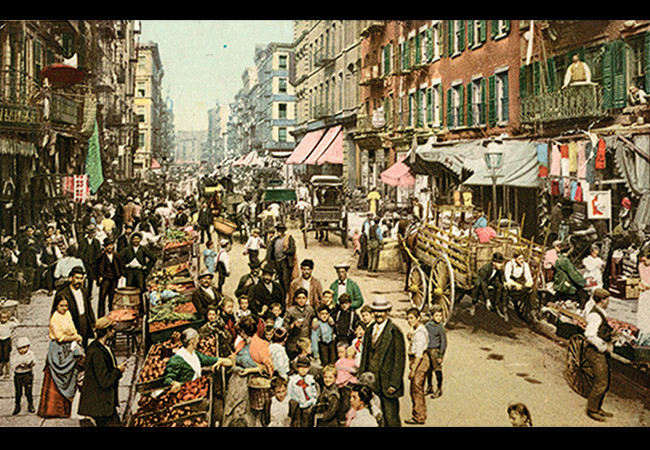 Among his most popular songs (both in America and Europe) was "Der pedler (The Peddler)," written shortly after his arrival in New York. 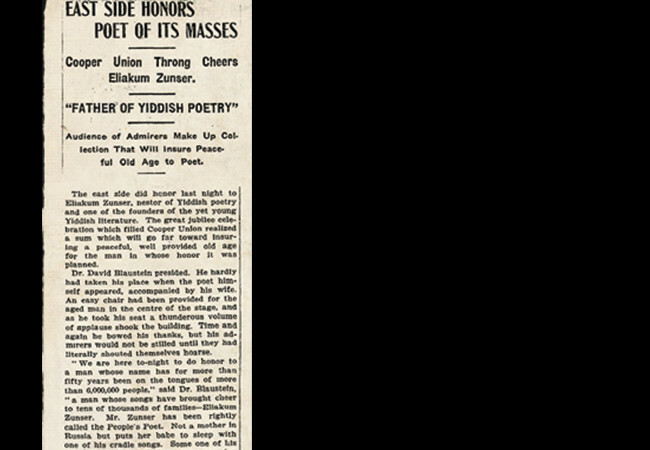 In March 1905, he was honored as the "father of Yiddish poetry" with a celebration made especially for him in Manhattan, as described in this New York Times article from March 31, 1905. Zunser's songs, notably those dealing with the shift from insularity and backwardness to modernity such as "In sokhe (At the Plough)," had an enduring popularity. 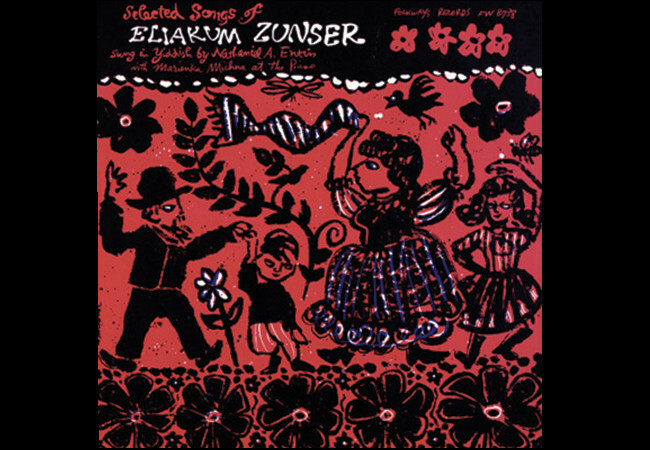 In 1963, musicologist Nathaniel Entin recorded this album of Zunser's songs for Folkways records. His autobiography, published in 1905, included introductions by luminaries such as Morris Rosenfeld and an English summary of the life of "A Jewish Bard." Despite these tragedies, Zunser devoted his life to bringing joy to others. He became a badkhn, a professional wedding entertainer, working first in Vilna and then based in Minsk, and his fame spread throughout the Jewish world. Known as Lyokemke Badkhn in Vilna, where his first songbook appeared in 1862, his fame spread and he performed around the Russian Empire. Zunser was an early Zionist and hoped to settle with the Biluim in Palestine. In 1889, however, he moved to America in 1889 and settled in New York in 1889. where he published poems about his new home, primarily in דאָס ייִדישע טאַגעבלאַט (The Yiddish [Jewish] Daily Journal). Zunser supported himself and his second wife as a printer, a trade he learned after he arrived. Through his songs, he continued to agitate for workers’ rights and other causes. 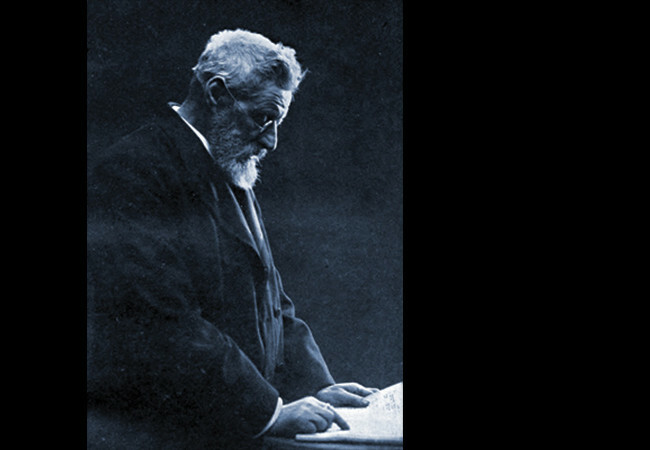 The composer of around 600 songs, in March 1905, he was honored as the “father of Yiddish poetry” with a celebration made especially for him in Manhattan. Zunser’s songs, notably those dealing with the shift from insularity and backwardness to modernity such as “In sokhe (At the Plough),” had an enduring popularity. 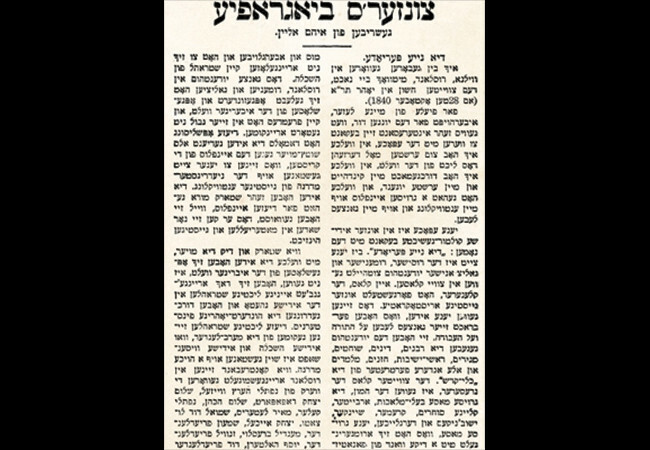 In his lifetime, Zunser wrote approximately 600 songs, published several books, wrote a dramatic version of מכירת יוסף (Mechiras yoysef, or The Selling of Joseph) and, in 1905, his autobiography, which included introductions by luminaries such as Morris Rosenfeld and an English summary of the life of A Jewish Bard. He died in New York on September 22, 1913.